Are you taking your thyroid medication properly…are you sure? After 3 years of taking thyroid medication for hypothyroidism every day, I found a great new thyroid doctor and for the first time discovered that I was taking my thyroid medication all wrong. 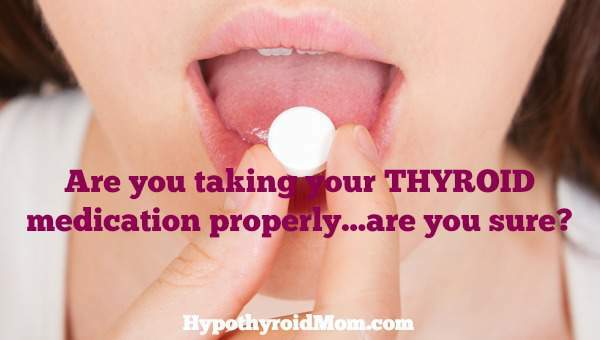 I was taking my medication at the very same time as foods, medications, and supplements known to interfere with the absorption of thyroid medication. Yet my previous thyroid doctor and pharmacists never thought to tell me such important information. I no longer take a T4-only levothyroxine medication like Synthroid, which is a popular prescription for hypothyroidism in mainstream medicine. I felt awful on T4 only. Some do great on these medications but I just didn’t. Our bodies are all different. I now take natural desiccated thyroid which contains both T4 and T3 thyroid hormones. My doctor has me divide my dose to twice a day to spread the affect of T3 in NDT to keep up my energy throughout the day. I take half of my dosage first thing in the morning when I wake up and the other half in the afternoon several hours apart from the food, supplements, and medications mentioned below in this article. First speak to your doctor before changing how you take your thyroid medication. Written by Kent Holtorf, M.D. If you are hypothyroid and taking a prescription thyroid hormone replacement drug, you may not be aware of the many rules that need to be followed when taking your medication. Something you may not know is how your other medications, vitamins, supplement, and even food choices are interfering wither thyroid medication. These are very important medication instructions to follow, however, there is more to the story when taking thyroid medication that you may not be aware of. Thyroid expert Mary Shomon writes about how some thyroid patients may benefit from taking thyroid medication at night. (4) Speak to your doctor before making changes to how you take your thyroid medication. Many medications, supplements, and foods are important to avoid or not consume within three to six hours of taking your thyroid medication. These interfere with the the body’s ability to absorb and utilize thyroid medication effectively. When an interference of absorption happens, serious things can occur. You may become under-medicated or even over-medicated depending on the substance causing the interference. So, which substances cause an absorption issue? If you are taking thyroid medication and you are prescribed an antibiotic, you will want to make sure that you know about how thyroid drugs and antibiotics can interact, affecting the absorption of your thyroid medication. There are a variety of reasons why you may need to take a larger-than-usual dose of thyroid hormone replacement medication— but one of the most common reasons is that you are taking a prescription or over-the-counter medication that affects absorption of your thyroid medication. Some medications decrease the absorption of thyroid medication while others increase it. This means that if you are taking thyroid drugs and an antibiotic from the quinolone family, it could interfere with absorption, and cause you to become substantially more hypothyroid. Interestingly, the antibiotic rifampin (also called rifampicin) — and known by brand names Rifadin, Rifamate and Rifater — significantly increased the absorption of the thyroid medication. This means that if you are taking the antibiotic along with your thyroid hormone replacement medication, it could actually cause you to become overmedicated, or experience hyperthyroid symptoms. Is there a solution? Some studies have found that the impact may be minimized if the antibiotic and thyroid medications were taken at least six hours apart. But it’s not agreed upon across the board by physicians. Your best bet is to discuss the issue with your practitioner at the time these drugs are prescribed (and before you get the prescription filled). There may be other antibiotics available for your treatment that are less likely to interfere with the effectiveness of your thyroid treatment. To be safe, take antibiotics 6 hours either before or after your thyroid medication. Note: Remember that if you are prescribed an antibiotic, you should also take measures to help protect your digestive health. Sucralfate (Carafate), a medication often prescribed for treatment of peptic ulcer disease or gastroesophageal reflux disease decreases the absorption of thyroid medication and should be taken 8 hours before or after. Cholestyramine and other cholesterol lowering drugs should be taken 4-6 hours apart from your thyroid medication. Raloxifene (Evista) for osteoporosis take 12 hours apart. Antidepressants: Many selective serotonin reuptake inhibitors (SSRI) like Prozac, Zoloft, and Paxil decrease the effectiveness of thyroid medication. Anti-seizure: Medications such as Tegretol, Dilantin, and Phenobarbital increase the metabolism and may require your physician to increase your thyroid dose. Insulin or an oral hypoglycemic drug take at least a few hours apart to avoid interaction. Talk to your doctor or pharmacist about all drugs and supplements that you are taking alongside your thyroid hormone replacement medication, to make sure that your timing minimizes any interference or absorption problems. Similar to supplements, foods rich in iron, fiber, or calcium such as calcium fortified orange juice or yogurt should be enjoyed at least 2 hours before or after taking your thyroid. Many times we seek different doctors for different reasons. While your endocrinologist could be prescribing your thyroid medication, the general family doctor you seek when sick with bacterial, viral, or maybe stomach issues is completely unaware of any other prescriptions. And we often times forget to mention the over the counter drugs we take, not giving the doctor the whole picture. It is always best to try and keep a list of medication, including supplements, handy to share with each doctor that you see. Observations of these time guidelines can make a huge difference in keeping your thyroid gland and medication performing at its best. Benvenga, S., et al. Altered Intestinal Absorption of L-Thyroxine Caused by Coffee. Thyroid. 2008; 18(3):293-301. Mazzaferri, E. Thyroid Hormone Therapy. Clinical Thyroidology for Patients: Summaries for Patients from Clinical Thyroidology. 2008; Vol 1, Iss 1. Sindoni, A., et al. Case Report: Coffee Impairs intestinal Absorption of Levothyroxine: Report of Additional Cases. Hot Thyroidology. Article 5/09. Could someone please tell me what natural desiccated thyroid is? I’m assuming it comes from an animal? Pig perhaps? I am on Armour 60mg sometimes my thyroid gets off but change mg until they get back on track. I have to watch bout other medicine that I would take for colds flu or anything cause it throws me into a thyroid storm . Had 3 the last one was from a generic zpack it was a bad one. If you’re going through alot with your thyroids you might need to look into these can be dangerous for u.
I was already aware of the importance of not eating for at least 1 hour after taking my Levothyroxine and not drinking caffeinated drinks. What I am having problems with is finding recipes that are strict hypothyroid. Some sights have recipes that contain foods that are on the do not eat lists. So confusing I have all but given up and eat whatever I want which undermines my medicine. I was also wondering about taking Benefiber halfway thru the day to help with constipation? I take mine at bedtime so I can have coffee in the morning. Plus all the vitamins I take just to feel semi normal. Thyroid disease is epidemic and in Canada most doctors only offer levothyroxin which actually makes a lot of patients gain weight. We aren’t treated right and we need to ad I ate for ourselves. I asked to have extensive blood work done but was ignored. I have asked again and my next test will be more inclusive but in Canada they will not test for reverse T3 as its to expensive as I was told. This is a serious disease not to be taken lightly and it is my wish that the medical community in Canada would treat it with the care and concern the patients who suffer from it deserve. I am in Ontario and reverse T3 is avaiable by GP, cost $30 in LifeLab. As far as I know, If your Cortisol level is normal your reverse T3 will too. Reverse T3 is also included in Comprehensive Thyroid Panel ordered by ND. I wouldn’t take any thyroid medication close to bed time as we needed it mostly for day. From my experience it is important to keep your free T3 and T4 in the middle range and anti thyroid antibodies low to none. Ferritin at normal range too. I went through many GP, Endo, two alternative MD and come to conclusion you better educate yourself than find Dr who fix and understand you. It is a bad horrible problem. So far system win. Find compationed GP they may help you more than Endo and other MD. Good Luck. I agree with you. I’m curious about your mention of Ferritin. I have higher levels than what is considered normal. I never knew this could also have an impact. Do you have more information on this? thyroid med that helps to continue to balance your thyroid. What would that be if it isn’t Armour? Thank you. My numbers were only 5 when the physician put me on. I wanted Armour but they substitute any thing and everything. I am only on 15mg. Can’t seem to lose wait. I am ready to take myself off but I am taking Almstead to lose weight but that is not good for the thyroid I just realized. So after this week I want to get off to see if I can lose weight. When I went on the medication I never had any symptoms and have not noticed any different being on the meds. Patty, It could be the dosage of your medication. Speak to your doctor about this or get another medical opinion. Here are resources to help find a good thyroid doctor in your area. Good to have you at Hypothyroid Mom.